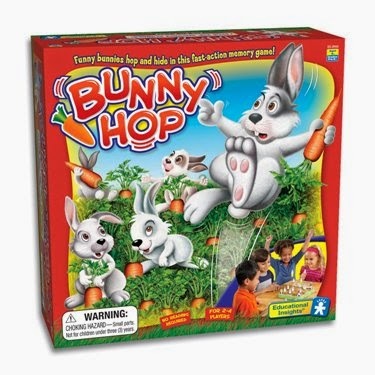 I recently stumbled across a really fun game that my students have enjoyed immensely: Bunny Hop by Educational Insights. I got lucky and found a copy of this game at Goodwill, complete save the instructions (which where downloadable online). Fortunately this game is pretty affordable on amazon, as well. What I like about this game is that the turns are quick and that there is an educational component as well, as students have to memorize information and strategize their next move. The premise is simple: the farmers' carrot field has been invaded by rabbits. The rabbits come in four colors: red, yellow, green, and blue. Some of the rabbits have the capability to hop, others do not. On their turn, players roll the multi-colored die, choose a matching rabbit, and push down on it. Then they push on one of the farmers (doesn't matter which one). If the bunny jumps out, players get to keep that bunny. Whoever gets a rabbit of each color first, is the winner. The game board. The yellow rabbit was a jumper! The die also has some special moves: the rainbow side lets you pick a bunny of any color (you can just take it, regardless of whether it is a jumper), and the arrow side makes you trade one of your bunnies with another player. This requires that players use some critical thinking and strategizing. A fun little addition to any speech room, especially around Easter!